In the world of skincare, there is no single best ingredient or even best group of ingredients. Just like your body needs a variety of healthy foods to thrive, your skin needs a variety of beneficial ingredients to look its best. Superfoods are one of them; in fact, they’re one of the secrets on how to get better skin. 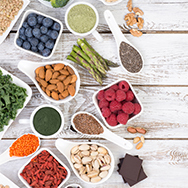 Whether you’re looking for foods for clear skin, foods for glowing skin, or just want better skin, both eating and applying superfoods can help. After examining the research—which we always do before making any skincare recommendations—we’ve come up with a list of the top 10 superfoods for skin, several of which we use in our products. Flax seed oil (also known as linseed oil) is a rich source of omega-3 fatty acids, which have a pronounced moisturising and calming action on skin. We include flax seed oil with other omega fatty acids in our Omega+ Complex Moisturiser. Spinach’s deep green colour makes it a rich source of antioxidants, including vitamins C, E, and K, all of which help defend skin from environmental aggressors. Oats are gentle powerhouses of soothing compounds that minimise signs of aggravated skin and ease uncomfortable dryness. Their soothing ability is why we include oat kernel extract (among other skin soothers) in our CLINICAL 1% Retinol Treatment. This spice is a natural source of curcumin and its derivatives, ingredients that have potent antioxidant and calming abilities. A growing body of research has shown that topical application of curcumin-derived ingredients visibly improves numerous skin concerns. Find them in our RESIST Barrier Repair Moisturiser. Not just for cooking or salad dressing, olive oil’s fatty acid and antioxidant content can dramatically improve skin texture, tone, and resilience. You can’t have glowing skin with a diet that lacks olive oil! It’s also easy to find in skincare, including in our RESIST Advanced Replenishing Toner, which contains oleic acid, a chief fatty acid in olive oil. This popular beverage is among the most researched antioxidants, and also considered among the most effective for addressing signs of ageing, including wrinkles and loss of firmness. One component in green tea, known as epigallocatechin gallate (EGCG), is especially impressive. We include EGCG in several products, including our best-selling RESIST Super Antioxidant Concentrate Serum. All types of grapes are a good source of antioxidants for skin, but red grapes are a natural source of the exciting antioxidant resveratrol. Studies have shown that topical application of resveratrol helps protect skin’s surface from agineg elements, while also promoting an even skin tone. Find resveratrol in our RESIST Super Light Daily Wrinkle Defense.